It's important to keep trying, and these tips can help. Anyone with kids has been there. And anyone who hasn't is either lying or a rarity. You've diligently looked up nutritious recipes, made your meal plan, and done your groceries. You've gotten through another hectic day of work (whether that work is inside or outside the house), picked your child up from school or daycare, and still managed to get a hot and healthy meal on the table at a reasonable hour. You did it, parent of the year! But then, you sit down as a family to eat, and the whining starts. Soon, the whining might turn to screaming. Entire plates of food might get whipped at the floor. Everyone is tense, and not a single person is actually consuming your "made with love" meal (you're too busy coaxing your child to open his mouth to eat anything yourself). Then it's tears, tears, so many tears. And the kids are pretty upset, too. "I have a super fussy eater to the point where every dinner is a challenge. Even as a dietitian I have to take a breath," registered dietitian and mom of two Carolyne Mondoux told HuffPost Canada in a phone interview. Mondoux, who lives in Ottawa, says she has gone through the gamut of eating challenges with her youngest daughter, who is eight. She'd rather lie on her chair than sit, Mondoux said. Some days she'll gobble down her food, and others she just puts on the brakes and refuses to touch her meal. "We're past the throwing food and the hoarding food, but she's still trying to find her position in life and where her control is at the dinner table," Mondoux said. These challenges can happen everywhere, and to everyone, Mondoux added. Part of the issue can be the food itself, since we all innately come with our own preferences, but a lot of it is also social as a child comes to terms with authority, she said. "For parents who might say that they have the perfect child who just sits at the table — they're the exception." 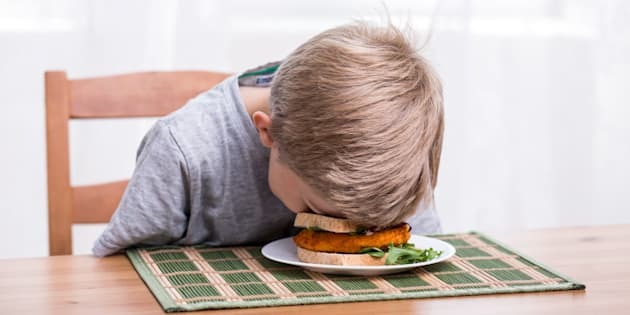 For some families, meal times can devolve into the throwing of food and "everybody winds up in tears and just hates having dinner together," Mondoux said. Dinner can be especially difficult since it comes at the end of a long day for everybody, she said. And when kids have their own plan, it can get upsetting. Still, it's important to try not to lose your cool at the table so that your child doesn't associate mealtimes with tension, Mondoux said. "Get up and move on," she said. An important guideline is for parents to decide the what (pasta), where (the kitchen table) and when (6 p.m.), Mondoux said. But kids are responsible for deciding if and how much they eat. So if they refuse to eat what you served, try to remember that it's OK if your child doesn't eat one meal. "They're going to catch up at the next meal, even if the next meal is the next morning," Mondoux said. Whether or not you give your child something else to fill them up, like a banana, is a personal choice, Mondoux added. March is Nutrition Month, and the Dietitians of Canada (DOC) have a number of suggestions for helping to foster healthy eating habits in children. One of their biggest tips is to include kids in the shopping and cooking of meals. But 38 per cent of parents never or rarely let children prepare a meal or snack, DOC says in a fact sheet, calling it a "missed opportunity." "Kids are more likely to eat what they've prepared," Mondoux said. Young children can help wash vegetables, three-to-four-year-olds can mash potatoes and bananas, kids age four to six can set a table, older kids can make a salad, kids age eight to 12 can make their own lunch or help plans meals, and teens can follow more complicated recipes, DOC says in their fact sheet. Help your child discover food and what they might like (or not like), and work from there, Mondoux said. With younger kids, give them lots of options and textures to try at the table so that they can try a bit of everything. If your toddler only wants to eat bananas, include bananas on their plate, but add some avocado cubes since the flavours might mesh, Mondoux suggested. Try to remove distractions, such as toys and screens, so that they can focus on their food, Mondoux said. Be a good role model and enthusiastically try all the food on your plate, she added. And don't give up. "It can take repetition over the course of a week, and sometimes it will take months for them to sort of grow into getting used to a new food," Mondoux said. Include older kids in the preparation of meals, give them choices ("You need a fruit for your lunches. What fruit do you want to try? "), and consider letting them pick the dinner menu sometimes. "It gives them a sense of ownership and something they can bring along with them throughout life," Mondoux said. "They're in a period of discovery and we want to set them up for a lifetime of healthy eating."